Update: Thanks to Marshall Kirkpatrick from ReadWriteWeb for writing an article on this topic this morning! New Wikipedia Layer on Geoloqi Gives You Vision Beyond the Greek Gods. Have you ever walked down the street in a new city and wanted to know what was around you? And I don’t mean bars and restaurants and coffeeshops, but the old buildings, strange statues and curious parks. There is a whole bunch of data out there that’s not tied to place, and a great deal of it exists on Wikipedia. 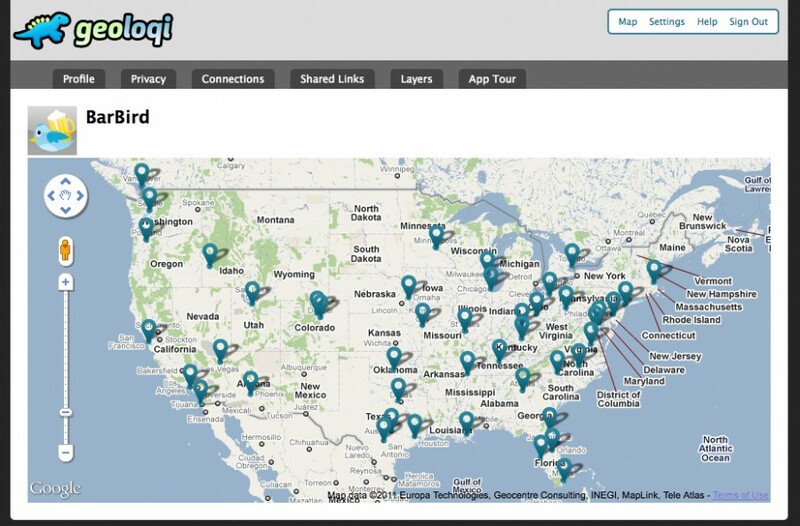 Back when we were working on Geoloqi at a dining table at a tiny apartment, ReadWriteWeb’s Marshall Kirkpatrick checked out what we were doing and got very excited. “I want to be able to get push notifications on my phone every time I pass near an off-line place that has a Wikipedia entry written about it”, he wrote. We thought it was a good idea too. There are many apps out there that have location-based Wikipedia data, some examples are Wikineer (built on Yahoo’s FireEagle), Geopedia and an iOS app from SimpleGeo. The problem with each of these apps is that you can only see the location-based content on a map, and you have to have the app open to see the information. You can’t just walk around and get interesting information pushed to you. On other apps you have to query to see what’s around you. Pushing location-based data to phones comes with a few problems. The first one is getting a good geocoded Wikipedia dataset. While we were searching for one, we encountered a few from developers who tried to make location-based geoplayers in the past. The datasets weren’t really ready for prime-time, though, so we looked around for a better source. Then at the Where 2.0 Conference we talked to our friends at InfoChimps, an awesome company that provides big datasets for developers like us. They agreed that a formatted set of geocoded Wikipedia articles would be a great dataset to bring to life. 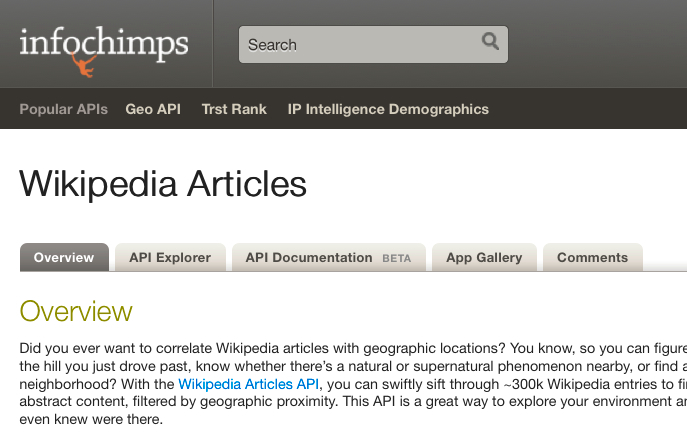 A few months later, InfoChimps’ Dennis Yang published a set of geocoded Wikipedia articles! and sent us an E-mail about it. We were able to take the articles and put them into a Layer in Geoloqi. After some testing and debugging, we were ready to release it life to the world. Yesterday when I was heading into the office, I passed a curious building that I wanted to know more about, so I turned on the Geoloqi Wikipedia layer. Seconds later, I received a push notification about that exact building! It turns out that it was called the Weatherly Building, and it was built by an ice cream tycoon who was credited with inventing the ice cream cone. It turns out that Mr. Weatherly served 90% of the regions ice cream business at the height of his success in the 1920′s, and operated out of a second hand freezer in a small candy shop when he started in the 1890s. I will never look at that building in the same way again. To subscribe, simply download Geoloqi for iPhone or Android and click on the Layers tab. You’ll be able to see a list of available content around you. Simply click on the Wikipedia layer and turn the switch to “on” to turn it on. 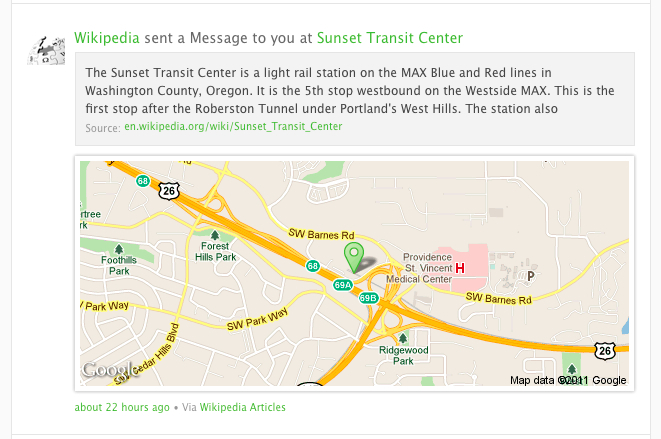 You’ll start getting Geocoded Wikipedia articles as you move around! If you already have Geoloqi, you can subscribe simply by clicking the button below. You’ll be prompted to log into Geoloqi and the Wikipedia layer will be added to your account. Subscribe to Wikipedia on Geoloqi! We made the Wikipedia article layer available worldwide, so if you’re anywhere in the world that has geocoded Wikipedia articles, you’ll be able to turn on the Geoloqi layer and get real-time information! 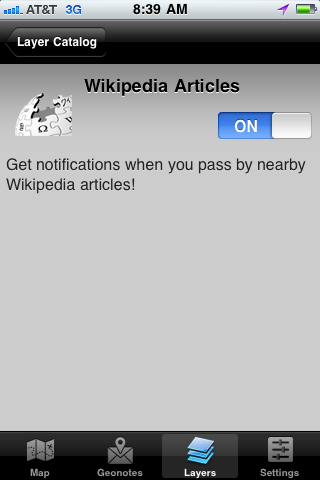 Also, all of the Wikipedia articles you pick up will be pushed to your activity stream, so you can read them later. 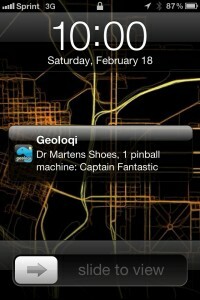 Geoloqi’s apps for iPhone and Android, while functional, drain the phone’s battery. We’ve been working on battery safe GPS technology for the past few months and persistent GPS functionality will be possible when we’re finished, or at least more feasible. 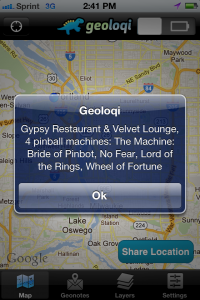 We’ll release the battery-safe features into the Geoloqi API and libraries so that you can use them too. 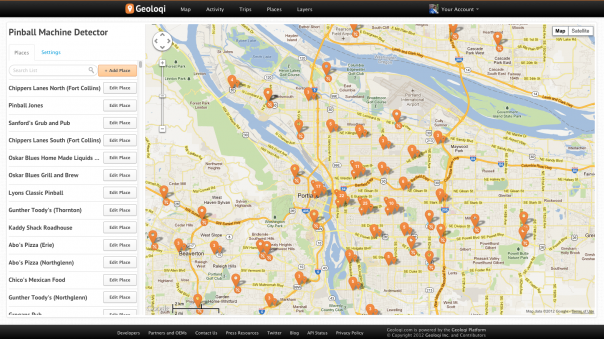 We’ll be adding more layers soon, and are going to make it increasingly easy for everyone to add layers to Geoloqi. We’ll post more information here on the blog. And if you have feedback on the layer, please let us know! We’re excited to hear about it. 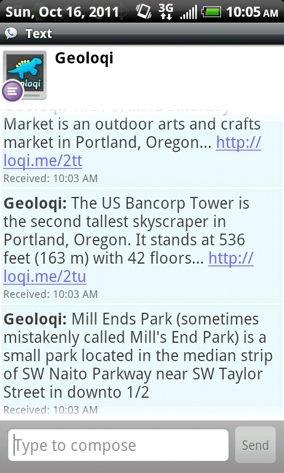 Geoloqi is a platform for real-time geo-content that is language agnostic, device agnostic, and driven by a real-time developer toolkit. You can follow us on Twitter @geoloqi, or you could try following the International Space Station instead. A great big thanks to the Geoloqi team, Marshall Kirkpatrick and InfoChimps for all of their help, data, and ideas! 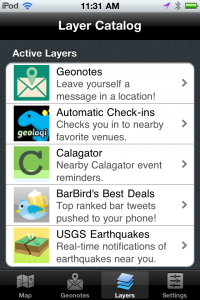 BarBird launches a Geoloqi layer! We’re happy to announce that BarBird, an app that allows you to see the nightlife scene in your city in real-time, has published a layer in the Geoloqi app! If you go to the Layers tab in your Geoloqi app, you’ll see the “BarBird” layer there if you’re in one of the cities they cover! Currently, they are in over 30 cities in the US, including New York City, London, Chicago, Austin, San Francisco, Los Angeles and Portland. 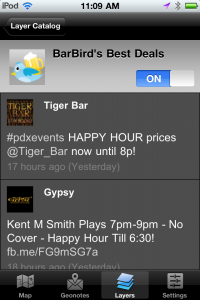 If you subscribe to the BarBird layer, you’ll get notifications of the top-ranked tweets about bar specials that are near you! Only the best tweets are selected for sending out, so you may not get a tweet right away. When you click on the layer in the app you’ll be able to see a list of tweets from local bars! If you click the “on” switch, you’ll start getting notifications about the tweets that are a few blocks away. When you get the push notification on your phone, you’ll be able to tap “View” and see more information about the deal from the BarBird mobile website. If you’re using the Android version of Geoloqi, you can still subscribe to this layer by following this link: Subscribe to BarBird’s Best Deals on Geoloqi!